Isabella Grinevskaya (1864–1944) was the pen name of Beyle (Berta) Friedberg, daughter of the Hebrew-language author Abraham Shalom Friedberg and the first wife of Mordechai Spector. She was born in Grodno in 1864 which at various times was part of Lithuania, Poland and Belarus though at the time was within the Russian Empire. In the 1880s she lived in St. Petersburg where she frequented Jewish literary circles and from the 1880s and 1890s she was published several times . Her first novel The Orphan was published in Hans Freind in 1888; the story "It Did Not Work" was published in an edition of the Juedisch Bibliothek. The story "From Happiness to the Grave" was published in Warsaw in 1894. In her books, she tried to depict the life of the Jewish middle class and mainly the situation of enlightened Jewish young girls. In the 1890s, she settled in Odessa, Ukraine, then part of the Russian Empire and undertook to write in Russian. As a playwright Grinevskaya wrote the play "Báb" based on the life an events of the founder of the Bábí religion which was performed in St. Petersburg in 1904 and again in 1916/7, translated into French and Tatar, and lauded by Leo Tolstoy and other reviewers at the time. Grikor Suni won the first prize in a contest based on the play before it and the music were confiscated. In 1910 she settled in Constantinople where there was a substantial Bahá'í population. In 1910-11 she met `Abdu'l-Bahá, then head of the Bahá'í Faith, when he traveled to Egypt. She became an active Bahá'í certainly before the 1920s. 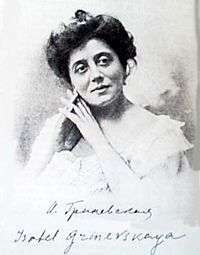 Grinevskaya had several other writings published: an essay of meeting `Abdu'l-Bahá, a poem and a play entitled Bahá'u'lláh, each about founder of the Bahá'í Faith, published though the play was never performed partly from the turmoil of World War I and the October Revolution, and she carried on correspondence with Russian intellectuals, Bahá'ís both in the East and to a lesser extent in the West (Martha Root, Star of the West) as well as traveling to Egypt, France, and Baku, Azerbaijan where there was a substantial Bahá'í population. Through her life she was in several Bahá'í communities and in touch with many others. Grinevskaya died in Istanbul in 1944. Some claim she was Polish, others Belarusian, but most people regard her as Russian. 1 2 3 "A.S.Fridberg , 6 Nov. 1838 - 21 March 1902". Retrieved 2009-03-22. ↑ "Short Description/History". Eastern BorderLands of the II Polish Republic. Paul Havers. 2008-11-18. Retrieved 2009-03-22. 1 2 Hassall, Graham (1993). "Notes on the Babi and Baha'i Religions in Russia and its territories". Journal of Bahá'í Studies. 5 (3): 41–80, 86. Retrieved 2009-03-20. ↑ "On Behalf of the Museum" (pdf). Official Website of the Suni Project. The Suni Project. ↑ Walbridge, John (March 2002). "Chapter Four - The Baha'i Faith in Turkey". Occasional Papers in Shaykhi, Babi and Baha'i Studies. 06 (1). ↑ "History in Poland". Official Webpage of the Bahá'ís of Poland. National Spiritual Assembly of the Bahá'ís of Poland. 2008. Retrieved 2009-03-20. Claims Grinevskaya was Polish, other sources claim she was Russian, others Belarusian (see The Baha’i Aesthetics by Valery Litvinchuk. See comments on history of Grodno above.